In this easy-to-read book, New York Times bestselling author Eric Metaxas offers straightforward answers to an array of common questions about Jesus. Metaxas presents his material in an entertaining, humorous style that makes apologetics engaging and fun. About "Everything You Always Wanted to Know About God (But Were Afraid To Ask)"
With a healthy dose of wit and a heaping helping of wisdom, "New York Times" bestselling author Eric Metaxas answers questions about Jesus' life, death, resurrection, and much more. 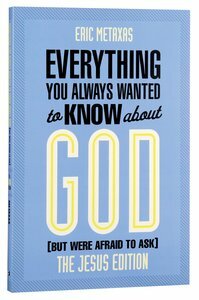 Customer Reviews For "Everything You Always Wanted to Know About God (But Were Afraid To Ask)"
This book has a very unusual style so I am not sure who it would appeal to. I did learn something from it but prefer not to wade through all the off-hand commenting. It seems quite Biblically based. A great book for all Christians, especially for those new to the faith or who still have many questions. Everything You Always Wanted to Know About God: Jesus Ed.